Новогодняя ёлка (the New Year tree) – do not throw away your Christmas tree once the holiday is over. Let it be for a few more days, but call it by its new name. Ironically, we must thank the Soviet Union’s Young Communist League for preserving the beloved tradition of putting up a New Year tree. 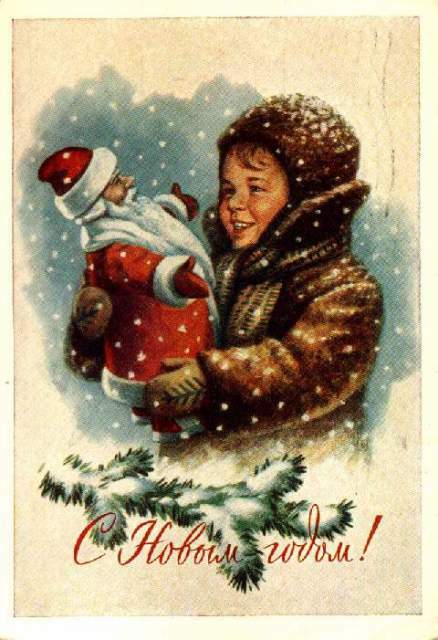 Дед Мороз (Grandfather Frost) – instead of Santa, Russian children believe in the no less mythical Grandfather Frost who wears a long blue or red шуба (fur coat), a matching шапка (hat) and валенки (felt boots) and carries gifts in a large мешок (sack) on his back. In addition to the sack with gifts, Grandfather Frost carries a magical посох (staff) that has the power заморозить (to freeze) everything around him. Unlike Santa, Grandfather Frost doesn’t rely on reindeer to fly him around, but instead walks and skies a lot (no pot belly!) or drives his magical тройка (a team of three horses). 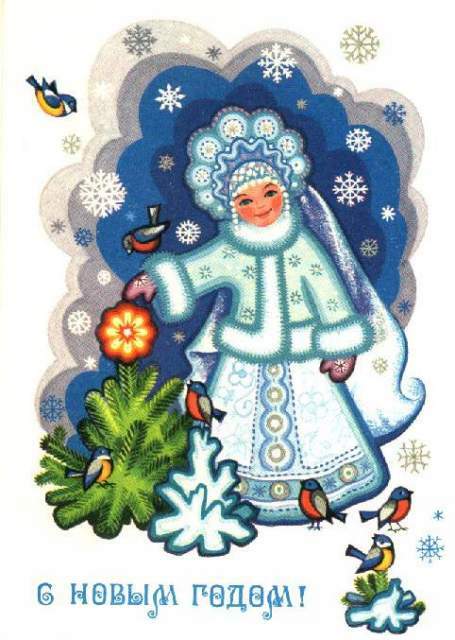 It is traditional to place two figurines under новогодняя ёлка – Дед Мороз and his внучка (granddaughter), Снегурочка (the Snow Maiden). She wears a blue or white fur coat and has a long blond braid that would make Goldilocks jealous. Wherever Дед Мороз goes, Снегурочка is not far away. На праздник к детям пришли Дед Мороз и Снегурочка – Grandfather Frost and the Snow Maiden appeared at the children’s party. If you can’t find a Снегурочка for your Russian New Year, don’t despair. Tell the kids that she went to the forest to help bunnies and deer decorate the New Year tree. But you must have Дед Мороз! Traditionally, many New Year’s parties are done as маскарад (costume party) or карнавал (costume party). In addition to dressing up as снежинки (snowflakes) or зайчата (baby bunnies), children must memorize a poem or a song to recite for Grandfather Frost at a party in exchange for a small gift. Обращение Президента (President’s аddress) – just before midnight, Russian President addresses the nation with a short речь (speech) in which he reflects on the past year and thanks the people for their support. Right after the speech, the chiming clock on the Kremlin’s Spasskaya Tower is shown counting down the last few seconds of the year. 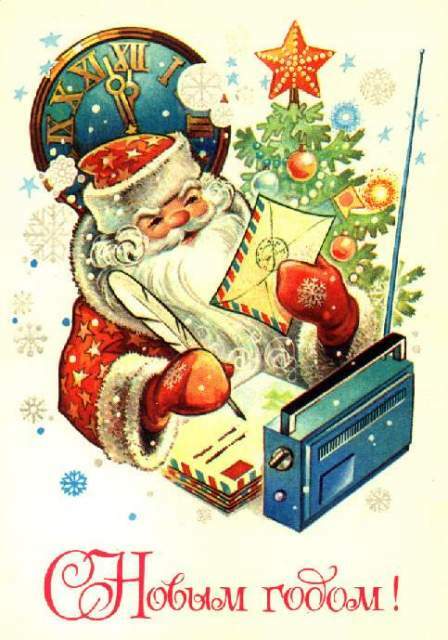 Новогодний Голубой огонёк – literally, “the New Year’s little blue light”, the name alludes to the bluish tint of the TV screens as well as to the popular Russian invitation заходите на огонёк (drop by whenever you see lit windows). Less literally, it is a name of a very popular New Year’s variety show on TV. Back in the Soviet days, it used to be the only entertainment programming available on TV on New Year’s night. Ирония судьбы, или С лёгким паром! (Irony of Fate) – as unavoidable as the Christmas Story in the US, this wonderful Soviet romantic comedy has been a workhorse of New Year’s programming ever since it came out in 1975. In the rare years that it is not played on New Year’s night, it is played a day or two before or after the New Year. Some other traditional New Year movies include Джентельмены удачи (Gentlemen of Fortune), Иван Васильевич меняет профессию (Ivan Vasilyevich: Back to the Future) and Карнавальная ночь (Carnival Night), all available on the Mosfilm’s YouTube channel. Старый Новый год (the Old New Year) – as we mentioned, Russians really love the New Year. That’s why they celebrate it not once, but twice each year. The second celebration is called Старый Новый год. Even though it is not an official holiday, January 14th is widely enjoyed although on a smaller scale. It is traditional to have another smaller застолье (feast). Most Russians keep their New Year trees until the Old New Year. thanks, some handy new words i can use at this time of year.с праздником. Many thanks for this post; love learning about Russian customs and way of life! I’m writing my Christmas/New Year card and would like to write a few words in Russian for my Russian friends. Can you suggest what to write in a card along with ‘С Новым годом!’? А худшее – не сможет повториться. Good question, maybe we need a post about this. God blees you.And happy new year. David, you are so welcome! Вам спасибо, Марчелло! Happy New Year! С Новым Годом, Аббас, с новым счастьем!